Make mailing labels a thing of the past in your office. Great for businesses that use check-writing software and computer-generated forms, Office Depot double-window, gummed envelopes let you display addresses from the inside. 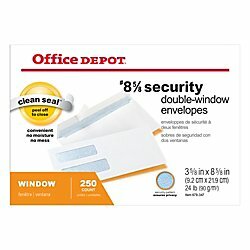 With Office Depot double-window, white envelopes, theres no need to write out labels! Two-window envelopes display the return and mailing address. Self-adhesive envelopes feature a security-tinted inside for privacy and confidentiality. 8 5/8 envelopes feature a self-adhesive closure that keeps contents safely inside. No need to write out labels! Windows display the return and mailing address. Self-adhesive closure keeps contents safely inside.